I have always wanted to see Alan Parsons live and stumbled across tickets to the sold out show on Ticketmaster…must have had some late releases or something, but but definitely lucked out. The show was a Friday night in Bow Washington which is about 80 miles north of Seattle where I worked so I knew I would have quite a drive through some of the worst traffic the area has…not unexpectedly, it took almost two and a half hours to get to the Skagit Casino. I gave myself plenty of time and got there in time to eat dinner at their restaurant called Encore. It was actually quite good. The filet mignon was an incredible piece of beef and was prepared perfectly. The show started a little after 8:00pm. The band seemed to be short on energy, but the music was awesome and I loved to see and hear all the songs that I have loved to listen to on various media throughout the years live. I particularly loved seeing and hearing the perform Damned If I Do, Don’t Answer Me, Time, Breakdown / The Raven, I Wouldn’t Want to Be Like You, Prime Time and my favorite of the night, Eye in the Sky. Definitely a show that I was glad to be able to see. Well, this is supposed to be KISS‘ last (End of the Road) tour, but I think we have heard that before. Regardless, I couldn’t run the risk of not seeing the greatest live band of all time one last time. 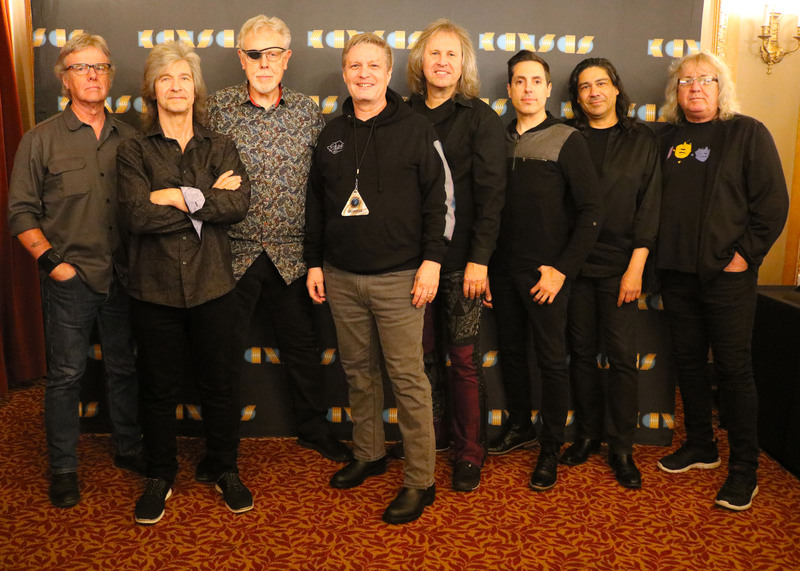 I also took advantage of an opportunity to meet the band back stage, and since this was “the last time they would ever tour”, I thought that I had better go big and participate in this as well. As typical, the show was running late, where we were to meet for the Meet and Greet at 5:30, we really didn’t;t get in to meet them until closer to 8:00, which actually wasn’t so bad as the crowd was pumped and there were a Buch of die-hard fans to keep us all entertained. The guys were pretty cool back stage, messing around and teasing people as they came in for pictures. 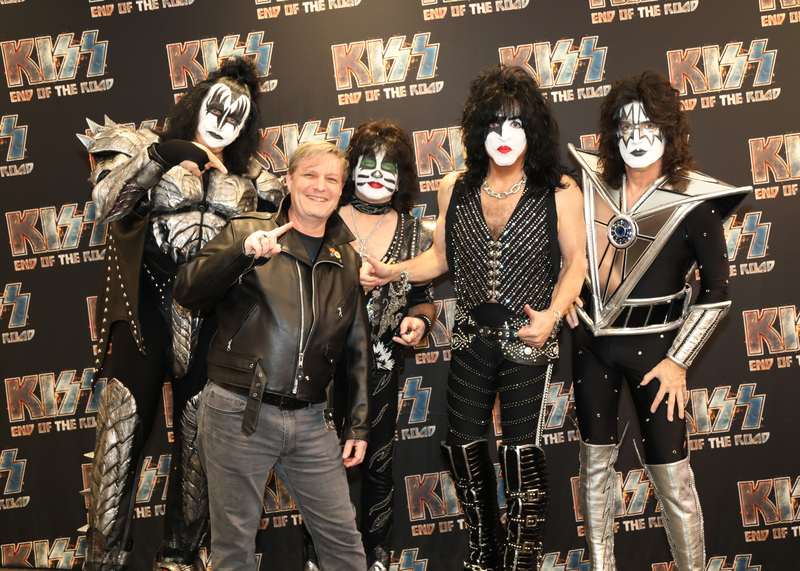 When it came to my turn for a photo, Eric Singer and Paul Stanley pulled the collar up on my jacket, called me Elvis and Paul gave the “Fonzie” thumbs up. A little silly, but the pictured turned out OK.
After the meet and greet, I went to find Toni and Nicki at our seats, which were awesome…just five rows from the floor with perfect view of stage left. The band came on (without opener) at between 8:30-9:00 and just tore it up. They started out with Detroit Rock City followed by Shout it out Loud and Deuce. They played throughout their nearly 50 year catalog including Heaven’s on Fire, Lick it Up, Psycho Circus, I Was Made for Lovin’ You and the encore was Beth, Do You Love Me and Rock and Roll All Night…what an incredible set of classics. If this was the last time I will ever see KISS live, then I will be happy as it was one of the best, but if for some reason they keep touring or start up again in a few years…well that’s OK too. Another Epic Metallica show last night at the Save Mart Center on the campus of Fresno State University in beautiful downtown Fresno California. Toni and I flew down from Seattle early Saturday morning and had a very relaxing time flaking out in the hotel in a town boarding Fresno called Clovis. We didn’t do much other than flake at the hotel and go out to eat up until showtime. We did have VIP (Whiplash Experience) which we had done the last time we saw Metallica in Seattle, and would definitely recommend. You are able to get into a pre-function prior to the show where they serve some pretty good hors d’oeuvres. They also give some pretty decent merch such as a show specific concert poster and t-shirt. A great way to pre-function prior to the show. Metallica came on pretty late (around 8:30-8:45) which gave way too much time for the pre-show with Jim Breuer who was funny for the first hour, but after two hours just got annoying. I came to see some metal after all, not a comedy show. The only thing the guy said that was worth while was when he warned “older” people not to participate in the mosh…if only the old guy who got knocked down and had to be carried out would have listed. This wasn’t the only incident that happened around us either…a guy down our row had to be physically removed from the arena due to his belligerency and some doped up loser assaulted a female security person, knocking her to the ground for not letting him do things he wasn’t;t supposed to…I just can’t understand why people just can’t come to a show to enjoy the music. Why they must be such a-holes. When they did finally come out, they came out as powerful as ever, opening with Hardwired and Atlas, Rise!. They jammed out a great set coving their whole history from their latest album to their old stuff such as Hit the Lights. My favorites of the night were Fuel, Seek and Destroy, Sad But True and Ride the Lightning. Metallica will always be a must see show, and I will continue to put up with the dorks in the crowd to hear and see them perform.